The plague numbers of Australian rabbits originally exposed to the myxoma virus had a mortality rate up to 99% in some areas. Over generations rabbits have gained resistance to the virus and their mortality rate has dropped to almost insignificance. Studies have shown that the virus has also changed to become less virulent, allowing their hosts to thrive, but not to the extent that the virus is incapable of either living in the host or spreading. Is this not an example of natural selection and therefore evolution? For those not familiar with the history of Australian rabbit control using the myxoma virus here is a brief background history. Rabbits were introduced into Australia in 1859 and by the late 1800s had spread throughout south-eastern Australia and up into sub-tropical regions. It has proven to be too hot for them to breed in tropical regions north of the Tropic of Capricorn. Although Europeans may regard them as small cute harmless furry animals, good for meat and fur, in Australia they became a serious feral menace, destroying crops, tree seedlings and grazing pasture, and causing erosion and degradation of both cultivated land and wilderness regions. Because of their rapid prolific breeding cycle, and their burrowing ability, they have proven impossible to control purely by physical and chemical methods. A method of biological control was suggested, and in 1950 the rabbit myxoma virus was introduced which rapidly reduced the rabbit population. Sadly by the end of the twentieth century rabbit numbers were again on the rise despite the virus remaining in the population. What happened? The reason turns out to be yet another example of the now well known equilibrium between a host and pathogen (disease causing microbe). All pathogens vary in virulence, i.e. how severely they affect the animal (or human) they are able to infect. Also, animal and human immune systems vary in response to infection. Furthermore, any infectious disease has to be able to spread from one host to another. If it kills off its host too quickly it will also die out with it. Therefore, whenever a new disease is introduced into a population it may rapidly spread through the population and kill off many animals. But if they haven’t had time to infect another host the highly virulent strains also die off, leaving its less virulent strains to survive long enough to continue to spread. The initial devastation also kills off any animals with weak immune systems leaving those with strong immune systems. The end result is a weakened virus and a stronger host. This is what happened with the introduction of the rabbit myoma virus in Australia. Initially the virus killed infected animals within days. As this virus is spread by insect bites, rather than direct transfer, many rabbits died before the virus could be spread. Nevertheless some survived long enough for mosquitoes and fleas to spread the disease, and rabbit numbers were rapidly reduced by over 90%. However, over the years less virulent strains that took longer to kill the rabbits, and therefore more likely to be passed on by insect bites, increased in number and became dominant in the virus population. This is selection, but it is not evolution! The microbe and the host are still the same species as before the infection. Highly virulent strains were selected out, leaving the less virulent ones to survive. The same goes for rabbits. Those who immune systems collapsed with the initial infection were selected out, leaving the tougher ones to survive. “Survival of the fittest” is a real process, but all observations show it did not, does not, and cannot make any living thing evolve into another. This process has been further assisted by mutations in the virus that have also made it weaker. However, it is still the same virus as the deadly virus released in 1950, so that is not evolution either. So, overall, the rabbit and myxoma virus history does involve selection and mutation, but not evolution. To repeat our often stated truth: for evolution to occur, rabbits or viruses would have to change into new kinds of animals or microbes, and neither shows any signs of doing this. FLU VACCINES: Do we need new ‘flu shots’ because the influenza virus is evolving? Answer here. EBOLA: Can Ebola become a problem in bat-plagued Charters Towers Australia? Answer here. 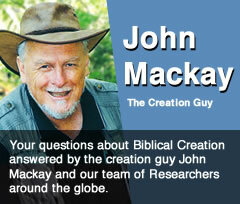 Creation Research DVDs: Did a Good God Make Bad Bugs? and The Real History of Worms and Germs. Both available at the Creation Research webshop here.